Strictly speaking, a mosaic floor is one which is made up of small pieces of material to form an ornamental pattern. Plain floors, similarly composed, are known as tessellated floors or pavements. The excavation team has sufficient evidence from their works to be able to state with absolute certainty that there were mosaic features present in the building, but that the passage of years and the plough have destroyed them, leaving only scatterings of individual half-inch cube tesserae. 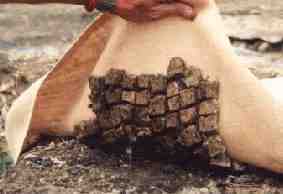 Those floors which have partially survived are all of the plain variety, made up of 1inch cubes. The image above shows the largest surviving area in-situ, though there were several smaller areas also present. All the tesserae in this example are white limestone though we also have tesserae made of grey limestone, limestone which has been deliberately made pink through heating, bright white chalk and cut red tile. 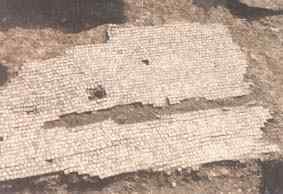 Several fragments of mosaic were found to be made up of alternating pink and white 1inch tesserae, which leads us to presume that there were coarse mosaics present as well as finer examples. An estimation of the total floor area covered in this fashion, as against the surface area of a single tessera, indicates that there were originally well over a million individually cut 1 inch cubes. One might imagine that such floors were not cheap! It is clear from the evidence that the round parts of the building also had tessellated flooring in whole or in part. To our knowledge, this is the first time that round structures of this kind have been found to have had such floors.